For those connoisseurs who love a dark Maduro cigar that possess a rich, full flavor profile, look no farther than Cohiba Black. These hand-rolled premium cigars are infused with Dominican tobaccos aged for at least three years and wrapped in a superb dark, oily, Connecticut Broadleaf wrapper that is smooth and silky to the touch. Cohiba Black premium cigars are medium-bodied packed full of robust flavors producing an incredibly smooth, espresso-like smoke. Stock up your humidors with these masterpiece premium hand-rolled cigars. 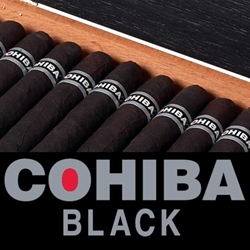 The Cohiba Black are handmade premium cigars that make an excellent choice for any cigar connoisseur. Smokers Discounts has made it easy and affordable to buy premium cigars online. A variety of sizes and flavors are listed below at our discount online cigar store. Each of these styles are in stock and available. Call us for more details!